The Library Company of Philadelphia will open a new exhibition, Stylish Books: Designing Philadelphia Furniture, on November 2, 2018. Curated by Curator of Arts & Artifacts and Reference Librarian, Linda August, Stylish Books will run through April 26, 2019. Printed designs spread new ideas. Artisans, as well as their patrons, relied on books as a way to learn about the latest fashions in interior decoration. 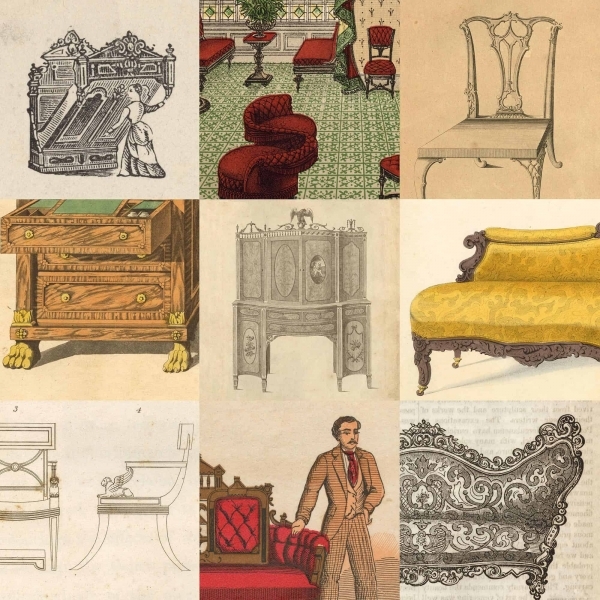 Philadelphia became a center for creating stylish furniture. The Library Company played a role by acquiring architecture and design books, which its members, who included cabinetmakers, frequently read and used. On display will be items spanning the 18th through 19th century. Highlights will include: Thomas Chippendale’s book, A Gentleman and Cabinet-Maker’s Director; the only known copy of the tradecard of Benjamin Randolph (who was a Library Company member); and colorful plates by Désiré Guilmard, who inspired Philadelphia cabinetmaker George Henkels. The Library Company will host an opening reception for Stylish Books November 2, 2018, from 5:00 pm – 7:00 pm. Additional programming for the exhibition includes a tour of the Center for Art in Wood (November 7, 2018), an author talk and book launch with Jay Robert Stiefel (December 10, 2018) for his new book, The Cabinetmaker’s Account: John Head’s Record of Craft and Commerce in Colonial Philadelphia, 1718-1753 (in partnership with the American Philosophical Society and the Athenaeum of Philadelphia), a curator-led gallery tour (January 16, 2019), a special collection review led by the Curator of Arts and Artifacts, Linda August (January 22, 2019), and a half-day symposium (April 3, 2019). The Library Company would like to thank the current sponsors for the exhibition and programs including the Center for American Art, Jay Robert Stiefel, and Freeman’s. Sponsorship opportunities are still available and will support the exhibition and related programs. Click here for more information. For more information about these programs and tours please go to the Library Company Calendar or contact the Programs and Events Coordinator, Clarissa Lowry at clowry@librarycompany.org or 215-546-3181.